Each day, 1,232 people are diagnosed with Alzheimer's disease. By the time you finish reading this article a few more people will be living Alzheimer's disease. Here is a startling perspective. It is not unusual for a person working on Wall Street (New York) to spend a total of three hours a day commuting to and from work. Many of these people live on Long Island, in Connecticut and New Jersey. There are 180 minutes in three hours. There are 10,800 seconds in three hours. While these people are commuting to and from work each day, another 154 persons are diagnosed with Alzheimer's. Each week, 8,634 people are diagnosed with Alzheimer's disease. A recent Harris Interactive poll showed that more than 100 million Americans have been touched by Alzheimer's. 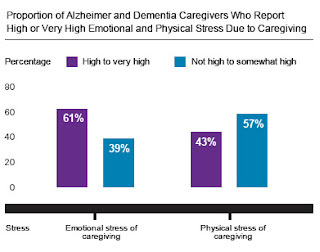 More than 33 million Americans are worried about Alzheimer's disease. Alzheimer's disease is a death sentence. Brain death. A typical person takes from 5-20 years to die. It is not unusual for the disease to take more than a decade to kill someone. When most people think about Alzheimer's they think about a person losing their memory. Persons that know someone suffering from Alzheimer's disease watch them lose their ability to brush their teeth, take a shower, put on their cloths, go to the bathroom, and eat. They await the worse day of them all -- the day the person suffering from Alzheimer's won't know them. Or anyone for that matter. Alzheimer's disease is sinister and ugly. If you don't know someone directly or indirectly that is suffering from Alzheimer's you will soon. It might have happened while you were reading this article. Bob DeMarco is the Founder of the Alzheimer's Reading Room and an Alzheimer's caregiver. Bob has written more than 4,600 articles with more than 349,100 links on the Internet. Bob resides in Delray Beach, FL.